As of summer 2018 I have left the University of Warwick. My new contact details can be found here. I was a postdoc, and before that a PhD student, in the Astronomy and Astrophysics group at the University of Warwick from 2013-2018, working with Prof. Boris Gänsicke. My academic CV can be found here. I study the remnants of planetary systems at white dwarf stars. These tiny, dead stars are often orbited by debris discs of gas and dust, the remains of planets and asteroids. These discs can be highly variable, and studying their behaviour can provide unique insights into the end-points of the evolution of planetary systems. Artists impression of a debris disc around a white dwarf, formed by the tidal disruption of an asteroid. Image Credit: NASA, ESA, STScI, and G. Bacon (STScI). Debris from these discs eventually falls onto the white dwarfs, observable as metal pollution in their otherwise pristine hydrogen or helium atmospheres. This means that measuring the abundances of the pollution can tell us the chemical composition of the planetary system around the white dwarf, allowing us to investigate the question of how similar the chemistry of exoplanets is to the Earth. In short, what do you make a planet from? To study these systems and answer these questions I make use of the largest and most powerful telescopes in the world, such as the Very Large Telescope and the Hubble Space Telescope. To find out more about my research you can follow the links below. I have also written more about it here, and click here for a summary in Up Goer Five style. In addition to my research, I am very interested in outreach and science education. I write about recent astronomy news for Astrobites and in my blog Stuff about Space, as well as on Twitter. As well as this I am involved in the Astronomy Group's planetarium, which you can find more information here. A full list of the outreach activites I have taken part in can be found here. 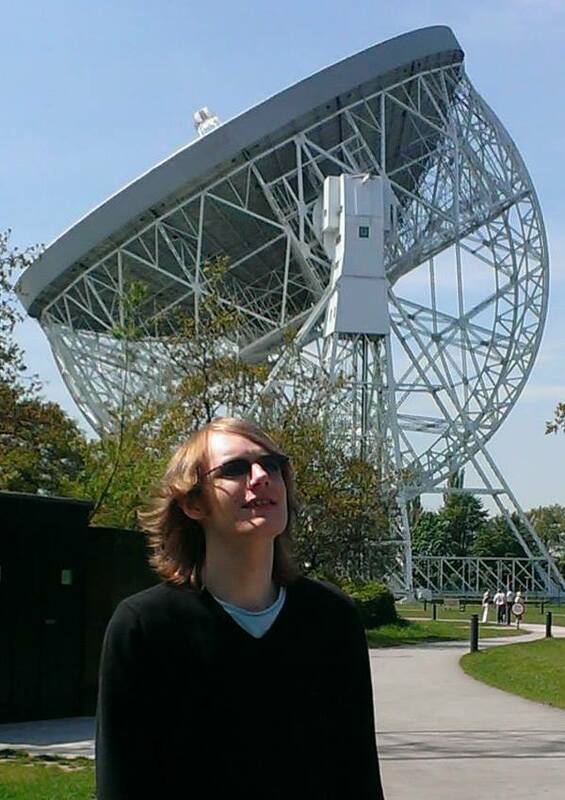 Note: I don't actually use the Lovell Telescope, I just like the picture! Wilson et al. (2016): "Carbon to oxygen ratios in extrasolar planetesimals". Wilson et al. (2015): "The Composition Of A Disrupted Extrasolar Planetesimal At SDSS J0845+2257 (Ton 345)". Wilson et al. (2014): "Variable Emission from a Gaseous Disc around a Metal-Polluted White Dwarf." More information here. Davenport et al. (2018): "The GALEX View of "Boyajian's Star" (KIC 8462852)"
Poster: "Carbon to oxygen ratios in extrasolar planetesimals" (Linking Exoplanet and Disk Compositions, STScI, Baltimore, September 2016). Talk: “New observations of the mysterious metal-polluted white dwarf GD 394” (20th European White Dwarf Workshop, Warwick, July 2016). Talk: "A Variable Gaseous Disc Around a Metal-Polluted White Dwarf" (European White Dwarf Workshop, Montreal, August 2014). Poster: "A Variable Gaseous Disc Around a Metal-Polluted White Dwarf" (Characterising Planetary Systems Across the HR Diagram, Cambridge, July 2014).